Before parachuting on the Island, Daniel Faraday was a professor of physics at Oxford. As it often happens in Lost, the name of the character alludes to a philosophical or scientific personality belonging to the past (including Locke, Rousseau, Hume, Rutherford and Minkowski), in this case to Michael Faraday (1791-1867), a leading scholar of electromagnetism and electrochemistry. In Because You Left (5×01),  Daniel Faraday has a fight with one of the series' main characters, the unruly Sawyer. Without providing clarifications, Faraday puts pressure on the group to quickly leave the beach. Sawyer does not trust him and asks for explanations. Faraday replies: “We really do not have time for me to try to explain. You have no idea how difficult that would be, for me to try to explain this... this phenomenon to a quantum physicist”. Sawyer, as is typical of the character, plays the part of the everyday man who does not accept to think there are things he can not understand. He slaps Faraday, forcing him to explain better: “The Island... Think of the Island like a record spinning on a turntable... only now, that record is skipping. Whatever Ben Linus did down at the Orchid station... I think... it may have... dislodged us...” “Dislodged us from what?”, asks one of the group. “Time”, is Faraday's answer. The physicist, literally forced to talk to a non-specialist audience, adopts one of the usual conventions, the metaphor, with which, in fiction and reality alike, a scientist tries to speak to the general public  Thanks to the metaphor, the scientist and the laypeople succeed in communicating, even if Faraday's answer generates great wonder among the listeners. The metaphor of the turntable brings to light an essential trait of Lost: the topic of time and time travel. Faraday claims that there are things only a quantum physicist can understand and Sawyer gets offended. Having to deal with time, the former is, nonetheless, probably right. After Einstein, science is no longer able to provide intuitive accounts on this issue. There is an equation that, at least potentially, can enable time travel, possibly – as it happens in The Variable (5×14) – allowing a mother (Eloise Hawking) to kill a son (Daniel Faraday) she has not given birth to yet (in a sort of weird, uncanny crossover between the myths of Medea and Oedipus) . The presence of science and scientists seems really necessary to explain what that Island is and what enigma it hides. Season×Episode. The details about the tv show cited (channel, creator, years of broadcasting) can be found in the filmography at the end of the article. See Massimiano Bucchi, “Metafore e paradossi nella comunicazione della scienza”, Sociologia e ricerca sociale, 51, 1996, pp. 32-45; and Theodore L. Brown, Making Truth. Metaphor in Science, University of Illinois Press, Urbana-Chicago, 2003. Parallel universes, time travels and miscellaneous space-time complications are among the favorite subjects of contemporary television fiction. These narrative artifices are no longer the exclusive pertinence of a genre (science-fiction) but permeate the whole audiovisual landscape. Specific scientific effects or mathematical paradoxes (and the philosophical challenges they generate) provide “formal devices”  for the multiplication of storylines. Seeking “complex plots”, television screenwriters find inspiration in intriguing and sophisticated theories such as general relativity or quantum mechanics. In addition to their indubitable intellectual appeal, either the hypothesis (string theory) and the certainties (uncertainty principle) of science allow writers who need to broaden their plots to take advantage of the expansion of the texture of reality produced by theories that admit the “consistency in a single experiential universe of otherwise irreconcilable situations”. If for an entire century of cinema “mad science” was characterized in large prevalence by individual deviance – an isolated and lonesome mad scientist who, as in The Invisible Man (James Whale, 1933), is pushed by his own hubris to go beyond the borders of the ethical or the admissible  – contemporary storytelling displays indeed a science which is forced by its own episteme to exceed the limits of the human mind. Fredric Jameson, Archaeologies of the Future. The Desire Called Utopia and Other Science Fictions, London-New York, Verso, 2007, p. 91. See Jason Mittell, Complex TV. The Poetics of Contemporary Television Storytelling, New York-London, New York University Press, 2015. Attilio Coco, “Le serie tv e l'esperienza del transito”, Segnocinema, n. 142, 2006, p. 24. Awake tells the diverging stories of two possible worlds generated by a car accident that involved the main character of the series, Detective Britten: in one (green universe) his son survives and his wife dies; in the other (red universe) his wife lives and his son dies. What we see is not just a bifurcation of the story in two mutually exclusive universes, as they are also able to communicate with each other. If A and B ascribe two different properties to a particle, such as being at two different places, then the superposition of states, written as A + B, has something in common both with state A and with state B. In particular, the particle will have non-zero probabilities for being in each of the two states, but not elsewhere, if the position of the particle is to be observed. [...] No longer do we speak about 'here or there'; in the quantum world we speak about 'here and there'. Following this theory, the two outcomes of the car accident (Britten's son or wife surviving; green or red universe) are evidently no longer alternative. The multiverse holds together both possibilities within a theoretical perspective that gives consistency to contradictory conclusions. Serial plots are not inspired by the most correct scientific theories or by the most recognized among scholars, but, often, by the “boldest” ones, such as the “many-worlds interpretation” of quantum mechanics linked to the name of the physicist Hugh Everett III. An example of how the name of Everett is dropped in a fictional dialogue is provided by Stranger Things. Kid: – Theoretical. But... but what if this gate already existed? Teacher: – Well, if it did, I think we'd know. It would disrupt gravity, the magnetic field, our environment. Heck, it might even swallow us up whole. Science is neat. But I'm afraid it's not very forgiving. We can also read the popular Alice in Quantum Land to get an illustration of the Everettian hypothesis: “The world has split into two worlds with slightly different versions of you in them”; “Mostly the split worlds would remain separate and would diverge without ever being aware of one another, but sometimes they will come together again at some point and give interference effects”. The above quotation is a quite precise description of Fringe's second universe, where the authorities have to cover with a substance called “amber” (so similar to a “featureless jelly or plasma”) the sites of the “fringe” events produced by the disruptive intrusions of the first universe. Also, the importance of the notion of the “observer” in twentieth-century physics is accounted in Fringe, thanks to the unearthly diegetic presence of mysterious characters named “Observers”. The reason behind the clash between the universes is in fact the presence of an Observer known as “September” in the laboratory of a scientist: the Observer distracts Walternate from an ongoing test, preventing him from saving his son Peter's life. Quantum mechanics, which is how we based our time travel, is not just simple time travel. Leonard Nimoy didn’t just go back and change history [...], and then everything is like Back to the Future. It’s using the rules of quantum mechanics, which means it’s an alternate universe where there is no going back. [...] There’s just another reality. Although the reference to quantum mechanics is certainly preposterous, it is important to recognize in this passage the author's will to attribute to science the solution of a narratological problem (and also the positioning of Into Darkness within the Star Trek media franchise), in an attempt to convey the rigour of scientific theory on the logic of film storytelling. The “parascientific” imaginary of fiction, ultimately, does not just express “the vulgarization of a thought that is born 'elsewhere', as a sort of expropriation”, but “the emergence of a new field of hybridized cultural practices”. What is interesting is to verify the convergence of what C. S. Snow called “the two cultures”, the scientific and the humanistic, often conceived in opposition. For further illustrations we can go back to Daniel Faraday being slapped and to the cause of the argument, i.e. : time. Aimir D. Aczel, Entanglement. The Greatest Mystery in Physics, New York, Four Walls Eight Windows, 2001, p. 25. Robert Gilmore, Alice in Quantum Land. An Allegory of Quantum Physics, New York, Springer-Verlag, 1995, pp. 90, 91. See Robert T. Jeschonek, Fringe Double-Blinded Me with Science, in Kevin R. Grazier (ed. ), Fringe Science. Parallel Universes, White Tulips, and Mad Scientists, Dallas, Smart Pop, 2011, pp. 213-234. Cited in Michel Bitbol, Schrödinger’s Philosophy of Quantum Mechanics, Berlin, Springer Science & Business Media, 1996, p. 127. < www.startrek.com/article/exclusive-orci-opens-up-about-star-trek-into-darkness-part-1 > (published: May 23, 2013; last access: November 13, 2013). Fulvio Carmagnola and Telmo Pievani, Pulp Times. Immagini del tempo nel cinema d’oggi, Roma, Meltemi, 2003, p. 201. Charles Percy Snow, The Two Cultures, Cambridge, Cambridge University Press, 2012. We may indeed consider Sawyer's request for explanations to Faraday a meta-textual question: given the centrality that the concept occupies in television narratives, the will of the serial characters to know “what time is” is a dip into self-awareness. Television storytelling, which proceeds through seasons, is an art that, much more than cinema, has to deal with transformations through time: transformation of the story world, of the characters' behaviour or attitude, and even of the actors' bodies – particularly visible in the presence of child actors, such as Anthony Jr. on The Sopranos. “What time is it” also means, thus, “who am I” (as a character) in this very narrative moment. The specific (science-fictional) issue of time travel is “perhaps the narrative figure that more than any other allows TV series to reflect upon their nature”. Besides the mentioned Lost and Fringe, also The 4400, Alcatraz, Heroes, Life on Mars, Ashes to Ashes, Dark adopt this artifice. But we also have to cite, from an earlier epoch, Quantum Leap, where a scientist, Dr. Sam Beckett, has developed a “Quantum Leap Accelerator” that enables the protagonist to travel through time. A jump into the future can also be the consequence of a “Near Death Experience”. But even this phenomenon, in an episode of Six Feet Under, is linked to quantum mechanics: in the first episode of the third season, Perfect Circles, we see one of the protagonists of the series, Nate, on the operating table. Apparently things go wrong, since we read on the screen “Nathaniel Samuel Fisher, Jr. / 1965-2002”. In the next sequences Nate enters into a state of indecision between life and death, in a labyrinth of different spaces or parallel universes where he sees a few of his possible future selves: he is in a restaurant with his deceased father, he lies dead in the coffin, then he finds himself in a semi-vegetative state. In one of these scenes Nate stares at one of his “doubles” sitting on a couch watching television. A character of the soap opera he is watching mentions “Dr. Schrödinger” and then asks “Remember Copenhagen?”. All of these moments can be described as “timequakes”,  breakages of the classical linear time. The serial narratives seem to abandon the “stubbornly persistent illusion” – in Albert Einstein's words – of the separation between past, present and future. Other serials that, like Six Feet Under, have nothing to do with science-fiction, such as Breaking Bad, seem to “push” time, in order to crush it, interpreting the future as something that has already happened. The flash-forward that opens the fifth season of Breaking Bad forces audiences to read all the following episodes in the light of the revelation here contained, when Walter White celebrates a sad birthday at a bar counter. In the same episode, Live Free or Die, we find the above mentioned reference to string theory. The owner of the junkyard that makes the joke, although perfectly aware of the complexity of the theoretical options, leads everything back to a pragmatic matter of budget. Similarly, the authors of Breaking Bad, at the beginning of the last season of the series, are empirically forced to resolve the intricacy of the diegetic system they built, to narrow the field of possibilities, to choose just one outcome among the infinite possibilities of the story, to collapse the narrative wave function. Jason Mittell, Complex TV. The Poetics of Contemporary Television Storytelling, New York-London, New York University Press, 2015, pos. 269-277 (Kindle Edition). Linda Williams, On The Wire, Durham-London, Duke University Press, 2014, p. 48. Luca Bandirali, Enrico Terrone, Filosofia delle serie tv. Dalla scena del crimine al trono di spade, Milano-Udine, Mimesis, 2013, p. 175. Jason Mittell, Complex TV, pos. 3180 [Kindle Edition]. On the subject of “doubles”, see Alberto Brodesco, “Body doubles. Scientific imagery and typologies of body multiplication in contemporary television series”, in Alberto Brodesco and Federico Giordano, eds., Body Images in the Post-Cinematic Scenario. The Digitization of Bodies, Milano-Udine, Mimesis International, pp. 51-61. See David Lavery, “Thinking Inside the Box: Heisenberg’s Indeterminancy Principle, the Paradox of Schrödinger’s Cat, and Television”, < cstonline.tv/schrodinger-on-tv > (published: November 22, 2012; last access: April 27, 2015). Kurt Vonnegut, Timequake. London, Penguin, 1998. See Alice Autelitano, Cronosismi. Il tempo nel cinema postmoderno, Udine, Campanotto, 2006. See Stephen Hawking, ed. A Stubbornly Persistent Illusion: The Essential Scientific Works of Albert Einstein, Philadephpia, Running Press, 2009. I have not yet mentioned the name of Heisenberg, which is instead one of the main myths or fetishes when television wants to allude to mysteries- or paradoxes-producing science. If we look at the huge number of references to the German physicist and his mind-blowing uncertainty principle in TV series we might even speak of a “Heisenberg effect”  in contemporary pop culture. Many of these citations are unnecessary or undue but, right or not, the continuous presence of the name of Heisenberg is revelatory or symptomatic. I write the “name of Heisenberg” to emphasize the distance between its “use value” and the actual historical figure of Werner Heisenberg. Similar to the “name of the father” in Lacan, the “name of Heisenberg” inserts the signifier “Heisenberg” in the symbolic regime. And just like the name of the father, the name of Heisenberg establishes a law, a taboo, a prohibition (to the complete knowledge of things). The examples start from Twin Peaks, a TV series that is fundamental in opening spaces for complex storytelling. In the episode Checkmate (2×20) Inspector Cooper is sitting in a bar, where he is trying to seduce the bartender, whispering that he thinks about her more than about Laura Palmer. She interrupts him by quoting a passage from an essay, specifying the author: “What we observe is not nature itself, but nature exposed to our method of questioning. ”. The name of Heisenberg is used as an “agent of sophistication” that induces to recognize the partiality of every approach, either sentimental or investigative. Another example occurs in the second episode of the first season of Numb3rs, titled Uncertainty Principle. The genius of numbers who is the protagonist of the series gives the police an equation that predicts the next targets of a gang of bank robbers. Applied to this plot the uncertainty principle simply means that the robbers, knowing they are being watched by the police, modify their actions. Commenting this episode, the mathematician Raazesh Sainudiin writes that the use of the uncertainty principle denotes the typical misunderstanding about what it describes: not the impossibility of simultaneously measuring two qualities of an object (position and momentum) but the generic role of an observer who, with his or her presence, alters the context of observation . Suggesting to move from the field of physics to social sciences, Sainudiin argues that it would be more correct to call the episode “The Hawthorne effect”, with reference to the term coined by Henry A. Landsberger to describe the increase in productivity attested at the Hawthorne factory among the workers who were aware of being under the scrutiny of scientific research. C.J. : – Yes and no. Director: – Because we’re here? C.J. : – I don’t have to tell you about the Heisenberg principle. Director: – The act of observing a phenomenon changes it? Talking about the abuses of Heisenberg in fiction, popular science writer David Lindley writes a comment exactly on this West Wing reference: “This is easy to understand. Put a bunch of cameras in the middle of a tense and private situation, and people will start acting oddly. No one who has taken photographs at a wedding or tried making a home movie of a family reunion will be surprised by this. Why drag Heisenberg into it?” . The Big Bang Theory follows the lives of a theoretical physicist (Sheldon), an experimental physicist (Leonard), a space engineer (Howard) and an astrophysicist (Rajesh). The usual precision of the scientific language used in The Big Bang Theory is confirmed by the ironical correctness of its Heisenberg reference. In the episode The Monopolar Expedition (2×32) Sheldon receives an email from the university rector, who invites him to his office for a meeting. Not knowing the reason for the invitation, Sheldon anxiously asks: “That’s 14 hours away. For the next 840 minutes, I’m effectively one of Heisenberg’s particles, I know where I am or I know how fast I’m going, but I can’t know both. Yet how am I supposed to carry on with this huge annoying thing hovering over my head?”. In the episode Scary Monsters and Super Creeps (1×06) of FlashForward, a scientist, on a train, seduces a girl posing as a “genius of quantum mechanics.” In the wagon-lit he tries to give her some explanation about the phenomenon of the “flash-forward”, the enigma around which the TV series is built, using the example of Schrödinger's cat. He concludes: “That's the miracle of quantum mechanics. The observer gets to decide”. Before moving to the two major cases pertaining to the presence of the name of Heisenberg in television series (Breaking Bad and Manhattan), I can cite a last example from the animated series Futurama: in the episode The Luck of the Fryrish (3×04), professor Farnsworth goes to the races. Two horses cross the end-line perfectly tied-up. An electronic microscope is used to indicate the winner. The speaker declares that the winner is horse number 3 “at quantum finish.” Farnsworth, who bet on another horse, complains: “No fair! You changed the outcome by measuring it!”. See Anna Ludovico (ed. ), Effetto Heisenberg, La rivoluzione scientifica che ha cambiato la storia, Roma, Armando, 2001. The quote comes from Werner Heisenberg, “The Representation of Nature in Contemporary Physics”, Daedalus, n. 3, 1958, p. 58. Raazesh Sainudiin, “The Math of Numb3rs 104: Uncertainty Principle”, < www.math.canterbury.ac.nz/~r.sainudiin/numb3rs/104/ > (last access: October 19, 2018). Henry A. Landsberger, Hawthorne Revisited, Ithaca, Cornell University, 1958. David Lindley, Uncertainty. Einstein, Heisenberg, Bohr, and the Struggle for the Soul of Science, New York, Anchor books, 2008, p. 213. In an early stage of his criminal career, Walter White, the main character of Breaking Bad, chooses the name of “Heisenberg” as a criminal pseudonym . It is a choice full of implications, one that provides an interpretative framework to his subsequent actions. Heisenberg means genius, pride and courage – qualities that finally Walt claims for himself. But because of the conduct of the German physicist during the Second World War, Heisenberg also means political ambiguity . Even the specific features ascribed to the uncertainty principle can be related to Breaking Bad's main character: although firmly sustained by scientific rationality, Walter White has to face the impossibility of simultaneously mastering all the variables implied in the field. This works for scientific experiments and for criminal enterprises: Walter can control some consequences of his activities in drug producing and dealing, but others will remain uncertain. He could not even remotely predict that the actions (to let a young girl die) carried out in episode Phoenix (2×12) would lead him to be involved in the collision of two airplanes and the death of 167 people in ABQ (2×13). A consideration can also be made on how the viewers relate to the character of Walter White. The uncertainty principle implies that two mutually exclusive behaviours may happen at the same time, as displayed in the Schrödinger's cat paradox, where a cat inside a box is concurrently alive and dead. In a similar way, the viewers are unable to take sides in front of the character of Walter White. We can not help identifying in some way with his struggle, even when his “wickedness” becomes blatant (“I'm not in danger. I am the danger”, he declares in Cornered, 4×06). The viewers thus live a sort of superposition of states – with Walt and against Walt. – You probably spent your whole life surrounded by people who weren't smart enough to recognize how smart you are. But I do. It's the reason why I brought you here. You are a once-in-a-generation mind. [...] But I know someone even smarter than you. When I met him, he was 25 years old and he was already reimagining quantum mechanics. And at 30, he was a leading light in our field. And now at 40, he could end this war once and for all. – Werner Heisenberg. He's the world's most brilliant scientific mind and he's running Hitler's bomb project. Never forget, Charlie, that is the man you're competing with. A few scenes later we find Charlie at home browsing a physics book to the page where a photographic portrait of Werner Heisenberg appears. He cuts out the picture to pin it on his blackboard at the lab. The sixth episode of the series, Acceptable Limits, shows Werner Heisenberg in person entering his lab on the other side of the ocean. A soldier with a helmet opens to Doktor Heisenberg a glass door that reads “Zyklotron”, behind which we see a bright hall decorated with Nazi flags. Heisenberg acts here simply as a dark presence or Doppelgänger. Another reference to Werner Heisenberg that points out to the role he played during World War II can be found in the alternate history described in the TV series The Man in the High Castle, describing a world where the Nazis dropped an atomic bomb on Washington on December 1945. The bomb is called “the Heisenberg Device”, deriving its name from its creator. Heisenberg has become a kind of contemporary television hero, almost a synonym for scientific mastery and mystery. The name of Heisenberg is the symptom of the “fear and desire” for uncertainty that characterizes the contemporary mediascape either on the production’s and the audience's side. I resume here very briefly a few of the considerations of my essay “Heisenberg: Epistemological Implications of a Criminal Pseudonym”, in David Pierson (ed. ), Breaking Bad: Critical Essays on the Contexts, Politics, Style, and Reception of the Television Series, Lanham, Lexington Books, 2013, pp. 53-69. See Nicolaas P. Landsman, “Getting Even with Heisenberg”, Studies in History and Philosophy of Modern Physics, 33, 2002, pp. 297-325. The successful theatrical work Copenhagen (1998) by Michael Frayn also insists on the question of Heisenberg's contribution to Nazi warfare research. From the point of view of the television industry, the opportunities offered by the “elegant universes”  described or hypothesized by science allow to add new ramifications and extend the success of a story: the relativity of space-time and the unpredictability of quantum mechanics allow, such as in a video-game, to give characters “additional lives”, to introduce collateral plots or to rewrite the old plot from scratch . From the spectator's point of view, the legitimacy conferred by science marks the narratives with a brand of rationality, creating a pleasurable mood of “rational mystery” or “mysterious rationality”. The entire structure of television series like Lost, Fringe, Alcatraz, The 4400, Dollhouse, FlashForward, Awake and Castle Rock takes the shape of a mind game , challenging the “reliability, necessity and readability” of the worlds depicted by fiction. These mental puzzles stimulate the “libido cognoscendi” of the viewers, their desire to know where the truth hides, to solve what initially appears enigmatic and indecipherable with logical criteria. Maintaining ambiguity is a cardinal point for the extended narratives we have considered, that try to keep together science and the irrational (Lost), parallel worlds (Awake, Fringe, Stranger Things, Castle Rock), conspiracy and revelation (Rubicon), or the equivocalness between human and non-human (Battlestar Galactica), friend and enemy (Homeland), moral and immoral conduct (Breaking Bad). What is praised is the uncertainty of these plotlines and their balancing between unpredictability and planning, surprise and suspense. The meeting on these bases between benefits of the audiovisual industry and popular following leads to the satisfaction of both interests. Science, ultimately, does not limit fantasy but sets it free. The social task assigned to science is to provide technical and theoretical tools to render the unknown known, to explain the inexplicable, but its history has led also to recognize the resistance of nature in front of the human will of knowledge and command . Scientific mystery always remains “mystery”, enabling the serial storytelling to give space, alongside with scientific theory, also to the magical, the mystical, the metaphysical, the paranormal , the supernatural. 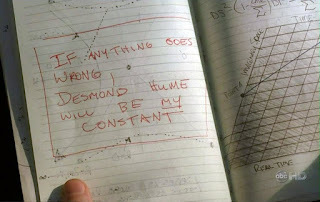 In the last episode of the first season of Lost (Exodus Part 2, 1×24) a brief dialogue between two of the protagonists of the series diegetizes precisely this reconciliation of physics and metaphysics, when John Locke says to Jack Shepard: “I think that's why you and I don't see eye-to-eye sometimes, Jack: because you're a man of science”. Jack replies: “Yeah, and what does that make you?” “Me? Well, I'm a man of faith”. The Island, with its own wisdom, will be able to unite these two opposing positions in a hendiadys. The universe's intelligence is greater than human beings', whether they are men of science or men of faith. Brian Greene, The Elegant Universe: Superstrings, Hidden Dimensions, and the Quest for the Ultimate Theory, New York, W. W. Norton & Co., 1999. We also have to account the existence of the literary genre of “quantum fiction”, a term coined by novelist Vanna Bonta, author of Flight: A Quantum Fiction Novel (1996). The genre employs “non-chronological plots and disrupted temporalities to render the characters' experience of quantum reality, such as parallel worldlines in multiverse, synchronicity (mirroring quantum entanglement), the impossibility of (quantum) suicide, consciousness as an active participant in the creation of reality, the unpredictability of reality, holism, and so on” (Sonia Front, “Temporality in British Quantum Fiction: An Overview”, in Alicja Bemben and Sonia Front, eds., ‘Hours like bright sweets in a jar’. Time and Temporality in Literature and Culture, Newcastle upon Tyne, Scholars Publishing, 2014, p. 32). One of the most famous quantum fiction novels is The Time Traveler's Wife, by Audrey Niffenegger (2003). A “genre” recently elaborated within the field of Film Studies is the “mind game film”: a movie – from The Sixth Sense (M. Night Shyamalan, 1999) to Inception (Christopher Nolan, 2010) – that inquires and defies audience's understanding, progressively unsettling and withdrawing the information and knowledge that the text had delivered (see Thomas Elasaesser, “The Mind Game Film”, in Warren Buckland, ed., Puzzle Films: Complex Storytelling in Contemporary Cinema, Malden-Oxford, Wiley-Blackwell, 2009, pp. 13-41). Federico Di Chio, L'illusione difficile. Cinema e serie tv nell'età della disillusione, Milano, Bompiani, 2011, p. 178. François Jost, De quoi les séries américaines sont-elles le symptôme?, Paris, CNRS Editions, 2011, p. 30. See Felix Brinker, “Hidden Agendas, Endless Investigations, and the Dynamics of Complexity: The Conspiratorial Mode of Storytelling in Contemporary American Television Series”, Aspeers, n. 5, 2012, pp. 87-109. See Andrea Fornasiero, “'...And They Have a Plan'. La promessa di un universo coerente in Battlestar Galactica”, in Aldo Grasso and Massimo Scaglioni (eds. ), Arredo di serie. I mondi possibili della serialità televisiva americana, Milano, Vita & Pensiero, 2009, pp. 75-84. “The more deeply we probe Nature’s secrets, the more profoundly we are driven into Plato’s world of mathematical ideals as we seek our understanding. Why is this so? At present, we can only see that as a mystery” (Roger Penrose, The Road to Reality. A Complete Guide to the Laws of the Universe, London, Jonathan Cape, 2004, p. 1029). In philosophical terms, we can add with Slavoj Žižek that quantum mechanics demonstrates that “the structure of disclosure or concealment, the fact that things always emerge out of their background Void truncated, never fully ontologically constituted, is that of reality itself, not only of our finite perception of it” (Slavoj Žižek, Less Than Nothing. Hegel and the Shadow of Dialectical Materialism, London-New York, Verso, 2012, p. 664). [38 ]As David Dylan Thomas suggests, in television “paranormal is the new normal” (David Dylan Thomas, “Paranormal is the New Normal”, in Kevin R. Grazier, ed., Fringe Science: Parallel Universes, White Tulips, and Mad Scientists, Dallas, Smart Pop, pp. 1-16). We can say in conclusion that the often awkward television appearances of Einstein, Heisenberg and Schrödinger (and their laws, principles and equations) lead us to four considerations about contemporary fiction and its audience: i. Need for time, space and indeterminacy: complex-yet-popular television series take advantage of the potentialities offered by complex-yet-popular scientific theories to expand, extend and complicate their narrative worlds. ii. Scientific mystery: television series appreciate the mystery of mind-breaking scientific theories and rely on them to include rational paradoxes into the story world. iii. Cognitive apprehension / epistemophilia : contemporary serials use scientific theories to inject into their narratives what we may call “cognitive apprehension”. The elements of “incomprehensibility” of the plot trigger the viewers' will to know, pushing them to search for rational explanations or solutions. As Henry Jenkins summarizes, “layers upon layers of references catalyze and sustain our epistemophilia”. iv. Another convergence: the cultural (or even “artistic”) value of science is increasingly recognized. Scientific and humanistic cultures converge more and more often. The Heisenberg principle is an icon of this convergence, being used (either legitimately or illegitimately) as a scientific work of art, a shared cultural heritage. Henry Jenkins, Convergence Culture: Where Old and New Media Collide, New York, New York University Press, 2006, pp. 98. In The Sopranos – a series that has no particular proximity with scientific thought – we see, in a crucial moment at the beginning of the last season, a very curious encounter. Tony Soprano is hospitalized, in a coma, shot by his uncle Junior, who suffers from dementia. After a few days, Tony restarts to talk and interact. It's actually an illusion those two boxers are separate entities. Their separate entities is simply the way we choose to perceive them. It's physics. Schrödinger equation. The boxers, you, me... we're all part of the same quantum field. Think of the two boxers as ocean waves or currents of air, two tornadoes, say. They appear to be two things, right? Two separate things. But they're not. Tornadoes are just wind, the wind stirred up in different directions. The fact is, nothing is separate. Everything's connected. The universe is just one big soup of molecules bumping up against one another. The shapes we see exist only in our own consciousness. In a TV series that, despite dozens of dead and hundreds of criminal activities, remains very static (the same people seem stuck in the same places and relationships), quantum mechanics here, at the beginning of the last season, is used to emphasize that the main key to interpret the whole show is the interconnections among the characters. The displacement of a single character causes major consequences to the others. This looks like an application of the quantum physics' principle of entanglement: within a Mafia family the relations among the members are strictly tied and their bond is impossible to solve. Even though the other Mafiosi are dismissing, Tony Soprano seems very convinced by Schwinn's explanation. The intelligence of the scientist strikes him, and the appeal to the centrality of consciousness sounds very persuasive to him. But Tony might also interpret his speech as a prophecy. He has survived his uncle's bullet, but we know that at the end of the season he will be in the (possibly) wrong place in the (possibly) wrong time . The “superposition of states” that ends The Sopranos, the last sequence, the mysterious black screen that left the viewers discussing the destiny of Tony, can certainly be classified under the label of Schrödinger. The point of view of The Sopranos' show-runner about the ending is expressed in Alan Sepinwall, “David Chase finally answers the 'Is Tony Soprano dead? ', < uproxx.com/sepinwall/david-chase-finally-answers-the-is-tony-soprano-dead-question-sort-of (published: August 27, 2014; last access: October 19, 2018). The 4400, USA Network, René Echevarria and Scott Peters, 2004-2007. Alcatraz, Fox, Elizabeth Sarnoff, Steven Lilien and Bryan Wynbrandt, 2012. Ashes to Ashes, BBC One, Matthew Grahama and Ashley Pharoah, 2008-2010. Awake, NBC, Kyle Killen, 2012. Battlestar Galactica, Sci Fi Channel, Ronald D. Moore, 2004-2009. The Big Bang Theory, CBS, Chuck Lorre and Bill Prady, 2007-. Breaking Bad, AMC, Vince Gilligan, 2008-2013. Castle Rock, Hulu, Sam Shaw and Dustin Thomason, 2018-. Dark, Netflix, Baran bo Odar and Jantje Friese, 2017-. Dollhouse, Fox, Joss Whedon, 2009-2010. Eureka, SyFy, Andrew Cosby and Jaime Paglia, 2006-2012. FlashForward, ABC, Brannon Braga, David S. Goyer and Robert J. Sawyer, 2009-2010. Fringe, Fox, J. J. Abrams, Roberto Orci and Alex Kurtzman, 2008-2013. Futurama, Fox, Matt Groening, 1999-2013. Heroes, NBC, Tim Kring, 2006-2010. Homeland, Showtime, Howard Gordon and Alex Gansa, 2011-. Manhattan, WGN America, Sam Shaw, 2014-2015. The Man in the High Castle, Amazon, Frank Spotnitz, 2015-. Numb3rs, CBS, Nicolas Falacci and Cheryl Heuton, 2005-2010. Life on Mars, BBC One, Matthew Graham, Tony Jordan, Ashley Pharoah, 2006-2007 (US remake: Life on Mars, ABC, Josh Appelbaum, Andre Nemec, and Scott Rosenberg, 2008-2009). Lost, ABC, Jeffrey Lieber, J. J. Abrams and Damon Lindelof, 2006-2010. Quantum Leap, NBC, Donald P. Bellisario, 1989-1993. Rubicon, AMC, Jason Horwitch, 2010. The Shield, FX, Shawn Ryan, 2002-2008. Sense8, Netflix, Lana Wachowski, Lilly Wachowski and J. Michael Straczynski, 2015-2018. Six Feet Under, HBO, Alan Ball, 2001-2005. Stranger Things, Netflix, Matt and Ross Duffer, 2016-. The Sopranos, HBO, David Chase, 1999-2007. Twin Peaks, ABC, Mark Frost and David Lynch, 1990-1991.